This entry was posted on	September 27, 2011 at 12:00	and is filed under bike equipment, bike racing. Either that or his bike just doesn’t fit him properly. I did an argument that might have been able to sprint better if he had been on his drops. i think too many amateur riders have their bars too high with a huge stack of spacers. They wonder why they cannot handle the bikes on the descents. I think there is the right way to fit someone on a bike and the wrong way. The serotta/US method of having the bars in the air is the wrong way and quite simply dangerous. If the trend in the peloton is going towards bigger headtubes with the rider in a more upright position then it’s pretty pointless in marketing aero bikes that will save you seconds in 100 mile race if then you are going to sit up in wind which will loose you minutes. Cav and his slammed stem won. What’s odd about that? Seems perfectly normal to me. Exactly, proving my point that bar position needs to be determined for the individual instead of blindly slamming stems and looking like Cav only at half the speed. HalfaCav, I should trademark that. Cav’s bars aren’t really that low at all, in fact his hoods are about the same height as his saddle when you look closely. Hi Dan, you’re absolutely right, unfortunately some people don’t look at useful data like that, they only care if he uses spacers or not. Of course smaller riders rarely use spacers because the headtubes are relatively long for them by default. Given the fact that this race ended in a bunch sprint of some 100+ riders, where would everyone have placed Cancellara? I think it’s clear he outperformed, and the chocolate medal is no mean feat. Optimal position is driven by several factors, not least of which in a road race is comfort, and empirically speaking, he is clearly most comfortable sprinting on his hoods. That said, point taken re flat bars – but the trend for shallow drops is increasing, so maybe will see him adopting a shallower bar in future – sponsor allowing of course…. 1) Cancellara is a much better sprinter than people give him credit for, especially in a power sprint like this he is among the world elite. He doesn’t often find himself in that position though. But even if we agree he performed better than expected, that would prove that a higher hand position (as he used) is good for him, and that slamming his stem is not. 2) I am not commenting on his position or even his hand position, I am pretty sure they are pretty much spot on for how he feels comfortable and fast. My point is that if that is the correct position for his body and hands, then that’s where his drops should be, not his hoods. This discussion seems to me to be predicated on the notion that the position in the drops is the most important and the one that fit should be worked around. Maybe so for a sprinter, but what if Fabs was to do as suggested and raise the bars to a height (either with spacers, riser stem or longer head tube) so that the drops are where his hoods are in the picture? What happens when he does the actual job that he’s best at, just hammering away the miles in TT mode on the hoods or with his forearms resting on the tops? Then he’s going to be way outside his optimum position, like a sail in the wind. Well said. Gerard is trying to support his position by picking random shots and it is a weak argument. I don’t think Spartacus could get anywhere near the drop he obviously wants with the new high head tube Cervelo models. 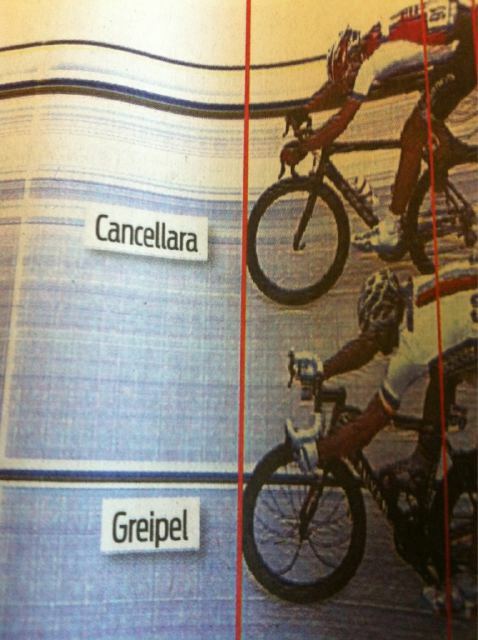 Please tell me you aren’t trying to say Cancellera is riding a non optimal position (for him) so he looks pro Gerard. Sheez! @ADAM It’s pointless to make an aero bike that the rider is not even comfortable on, bc then the rider will not even want to ride fast. Its abt everything: comfort, aero, the “right” positioning and that “magic” element that the rider throws into the mix, whatever that is. Look @ Cadel Evans’ position. Is it not clearly much lower thn usual? But, that’s “the way he rides”, the way he likes it. Thus it’s optimal…until he changes! That is what I believe. ;) What do you all think – esp.you Gerard or esp.any of you established, experienced, reputable experts on bike fit? So Fabian is nosed out by one of the best sprinters in the world. The fact that FC was even in that position was more than anyone would have expected. Bar position had absolutely ZERO to do with finish. Nobody seems to claim it had, only that if THAT’s his hand position for the best performance, it’s hard to see why he still has drops below those hoods. So that he’s lower (and aero) on the hoods where he spends most of his time while still being allowed to change positions regularly. Bike fit is a very personal thing. If you are more flexible than other riders you can get a lower handlebar position without any problems. But if you put the handlebar too low you will simply lose power output, resulting in decreased performance. And it can even cause injuries. As Gerard pointed out in his previous blogs, riders with their handlebars too low ride more on the hoods and less in the drops. Last Sunday I noticed many riders attacked on the climb, and continued to ride on the hoods after they got to the top. This is while they were riding flat out. When I ride flat out on a flat or descending road I NEVER have my hands on the hoods. That’s because I have the correct handlebar height so I don’t HAVE to ride with my hands on the hoods without losing power. On the Cancellara sprint: If Cancellara would have done exactly the same sprint (same speed) with his hands in the drops he would have got 3rd place because he could have made a bigger jump on the line. But on the other side, it was an uphill finish and it’s not uncommon to sprint with your hands on the hoods when it’s slightly uphill. And Cancellara is not a real sprinter so sprinting on the hoods can be more natural to him with any bar height. So I’m not sure his bar height was the problem here. I disagree. Fabs is already so low on his hoods with the that back angle dropping even lower is likely to slow him down from both aero drag increase and power drop. 1. His arms and hands are more comfortable on the hoods than in the drops. In that case it’s best to get your bike position right with your hands on the hoods. 2. His handlebar is too low, causing a decrease in power output and maybe also an increase in drag when he gets his hands in the drops. Wouldn’t you say it would be better to raise the handlebar in that case? I think 1 is correct as you have many different positions to shift to when on the hoods. I think you would have a hard time arguing the the multiple world TT champion doesn’t know how to set his bike up optimally. Regarding #2, it appears he often uses the drops in descending, not sure about tight corners. That second red line clearly indicate that actually Cancellaras postition was lower than Andres… As it stands on on the closer to Fabians hips but on other side closer on Andres shoulders, and because they are equal on line with wheels only answer on how is that possible is that Fabians angle is smaller (comparing on horizontal axis) which means he is lower, as I mention before. Good point and especially indicative and well selected picutre which explains everything Gerard! Watch the finish again. FC wasn’t standing to sprint. He was doing his normal seated super-diesel top end. Go back and watch the Tour stage when he attacked with 1k to go. Never stood up…never got in the hooks. Sure, but what does that prove? Unless you want to tell me that he wasn’t putting in his best effort, the argument remains the same. He is at maximum effort yet not in the drops. If he doesn’t use them at that stage in the race, he should cut them off. While his hand position didn’t cost him Bronze (as I am sure his hands were in his preferred position), the drag of the drops probably did. That is a possible point. What position does he ride when descending? He does descend in the drops at least some times so I’m sure he’d rather not cut them always. Since there were no descents on this course, you’re comment stands and he probably should have run a flat bar. Ahem. I just re-watched the last 15k of the 2010 RvV. Cancellara rides from the Muur to the finish either with hands on the hoods or with hands draped over the tops in tt-mode. Boonen, otoh, rides mostly in the drops. And loses over a minute in that 15k. Now, a lot of that time loss comes from wheels and tire pressure . . . but this argument over-looks the possibility that a rider is MORE aero and faster riding on the hoods. And . . . as many others have pointed out, raising the bars so that Cancellara could ride in the hoods more would screw up his hands-over-the-top position. I think Magnus Backstedt said something along those lines while commentating during a race on Eurosport this year. IIRC he said they spent around half a day in a wind tunnel and found his most aero position was with hands on the hoods and forearms horizontal. You’re absolutely right, he IS more aero and faster when he has his hands on the hoods, that’s the whole point. I think what’s critical here is that the rider finishes when their front tire breaks the finish line plane. Both those riders are really close (although I know the official result I can’t tell which one is ahead from that picture). However… if you look at their hand position relative to their front wheel, Greipel’s hands are distinctly further back on the bike. In other words given a set amount of bike throw, his front wheel will be further ahead than Cancellara’s. If you draw a line down their hands, Cancellara’s hands are clearly ahead of Greipel’s, but because Cancellara is holding the hoods, his bike is not as far forward. Of course Cancellara may have been banking on doing some solo TT thing to the line, using the invisible aero bar position, and maybe his bar height is a bit better for that. He’s won on the hoods before, like that stage in the Tour where he out-led-out the leadout guys and rode away from the field just before the sprint. This was exactly what was evident to me when I saw the photo. Cancellara’s center of mass was likely 3rd. But COM doesn’t count. If you have a deep bar position it’s a little easier to throw the bike when you’re on the hoods. Gérard, stop trying to make people believe the upright position is better for racing when really, it’s just better for most people, especially those new to the sport or with back problems. In my opinion the new Cervelo’s are not more aero with a rider on top – at least it seems that way because I get more draft off them! Just take a look at Zabriskie trying to get aero on S5 on the Cervelo website. See also the plethora of -17 degree stems on the bikes. Some of us really are more comfortable with deep bars and “slammed” stems. Thanks Beev, He sure is in the drops on this descent in Beev’s link..
Just look when fc won Flanders, after he left Boonen he was full out on the hoods, with his arms at perfect right angles. Check his sprint from MSR this past year and Bejing Olympics. Don’t exactly see your point as in the Olympics he’s on the hoods while he’s in the drops in MSR. Good point about the position after he rode away from Boonen though, his hands/arms seem to be more comfortable on the hoods than in the drops, so raising the bar would only ruin his perfect position. And the MSR sprint proves that he does use the drops, so there’s no reason to get him a flat bar. What’s interesting to me is that Cancellara looks to be in a lower position on the hoods than Greipel in the drops. Also looks that if Cancellara was in the drops his hands would be almost even with his ankles! I agree with Gerard in that “slamming” isn’t something that should be done blindly but proper fit it the key. That said I think it’s a really really weak argument to try to prove a point based on one photo and of a rider in a photo-finish sprint who is a 4 time world time trial champion (aka, not a sprinter). It just makes no sense to use Fabian as an example for proper bar height and whether or not he should have been in the drops or not. Look for photos of him and you will find that 99% are on a TT bike but there are some of him using the drops, usually when descending, so he’s obviously comfortable in the drops as well. Maybe he just feels more comfortable sprinting on the hoods. His position when sprinting on the hoods is not particularly low, however I wouldnt imagine flexability is much of an issue for cancellara as he manages to maintain a very low flexible position on his TT bike. Also cutting the drops of the bars wouldnt be the best idea as personally I find I have much more control of the bike and better access to the brakes when in the drops descending even though I dont use them much the rest of the time. I think we should be encouraging young riders to be as low on the bars as their flexibility and body shape will allow without losing power. If cervelo’s are all going to be like Specialized roubaix in the headtube in the future, then i think this is a backward’s step in bike geometry trends. i’m getting confused by the aero bike ‘trend’ paired with increase in headtube lengths, just doesn’t make sense to me. If Gerard would say it’s simply a marketing decision as most cyclists use spacers or a rise stem then I could accept that. Trying to justify a taller head tube as being more aero is a difficult sell, and impossible for riders like me who already use a -17 degree on a slammed SLC-SL. I still plan to buy a S5 but go a size smaller and stick with the -17 degree stem. To be fair, it was an uphill sprint, correct? One of America’s best sprinters, Ivan Domingez, was/is well known for sprinting from the hoods. If you know anything about Ivan, he was dominant. I don’t think there is an overarching rule, right or wrong…just ride what you like. Manufacturers should make headtubes larger some 10-20mm to urge riders upward. If you really want to get low and “pro” then you can ride a -17 stem or better yet, get the correct fitting bicycle. One thing we all need to remember, pros today are riding stock geometries (for the most part) in The Cannibal’s day each and every professional rider was on custom geometry. Cancellera just prefers his being riding on his shifters. If you look back at his big wins, he’s still on the shifters. 2010 RVV, 2008 MSR winning attack. Can’t criticize what he prefers. Just like he sticks with mechanical Dura Ace. Someone who’s been riding that long knows what they prefer. As mminsq said it s not the first time cancel do this kind of sprint see: Stage 3 of tdf 2007 ! But for sure , it s not the right thing to do in a sprint. @gerardvrommen: do you remeber mike Pigg ? Obviously I remember Stage 3 in 2007, he was on a Cervelo and in yellow. I think technically that was executed well, it wasn’t really a sprint either (well, one could classify it as a 1km sprint). It was certainly one of the most amazing feats of jumping away for the last kilometer, with none of the sprinters able to catch him. Which also shows that he is actually a very good sprinter if he wants to be. Gerard, I agree in some points, but please provide us frames which enable what you are claiming! Just assembled a RS for my wife. She is 1.74cm, rather long legs, rather short upper body. Went for the Size 51 because my 54 S2 was far to long for her. Added 4cm of spacers and a +6° 7cm stem. Now her bar is still 8cm below the saddle. hm.. This is actually a “comfort” frame.. With the actual bike geometries you have no chance to have your bar at a reasonable high level without using tons of spacers or ridiculous short and steep stems.. And the extra 1cm of stack you added to the new frame generation does not make the difference you talk about..
With shallow drop bars, it does not seem that body angle changes much if any when on the hoods or in the drops. As the hoods are a bit further to reach than the drops it pretty evens things out. I have watched pro bike racers switch between the hoods and drops with no discernible change in the position of their back. Very true. And with the back hardly changing, the hood position is the most aero (less frontal area and better angle of attack for the arms). If Cancellara’s bars had been higher, he’d have been holding the drops rather than the lever hoods when sprinting. And so his hands wouldn’t have been quite so far forward. In consequence, when he threw the bike forward on the line, his mass-centre would have gone slightly further back (relative to the bike) ….. and he’d have got the bronze medal. I don’t for one moment suggest that that should be a criterion for setting one’s bar height. But it’s worth a smile. This article is very interesting. Now i look at pro riders and many always ride on the hood even downhill during the tdf ! I could not believe it… By the way i think the pursuit bar would suit most rider better than classic shape but it’s not UCI legal i believe and they aren’t even shifter suited for. I think the pursuit bar is better because in the end i feel the gap between drop and hood is always too big (i ride wing pro compact, the most compact bar to solve that). I always feel either too stretched on the bar and taking too much wind on the drop. I think on my next bike i’ll put the bar a little bit higher and never use the hood except for trianing recovery.